Forget jams and jellies; this golden Ambrosia apple butter recipe will take your toast to the next level. Apple butter has been around for a long time – just ask your Granny! It’s essentially a slow-cooked apple sauce reduction. Don’t be fooled by the name; there’s no actual butter in the recipe. But, it’s just as spreadable and way more delicious. For this recipe, we tapped into the current turmeric trend to make a ‘golden’ version of apple butter. Turmeric has anti-inflammatory properties and its flavour is a perfect pairing with the sweetness of the Ambrosia apple. We used a slow cooker for this recipe but you could easily do this on the stovetop or in the oven. This recipe makes about a litre which will keep in a sealed container, in the fridge for a couple of weeks. If you’re comfortable with canning methods, then it will keep much longer. One last note, we kept the sugar to a minimum because Ambrosia apples are already sweet. Depending on the degree of your sweet-tooth you could reduce or even eliminate the sugar. The result using this recipe will be moderately sweet. Dust off the slow-cooker. 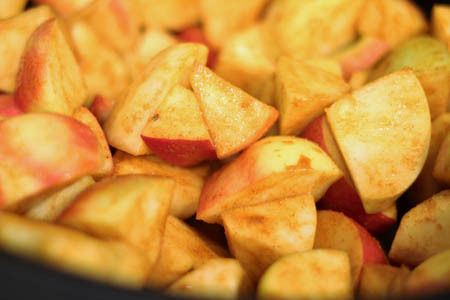 Here’s how to make Turmeric Ambrosia Apple Butter. Chop Ambrosia apples removing the seeds and stems but leaving the skin on. Place in the slow cooker. Mix remaining ingredients and pour over apples. Toss until apples are evenly covered. Put lid on the slow cooker and cook on high for 5-6 hours, stirring hourly. 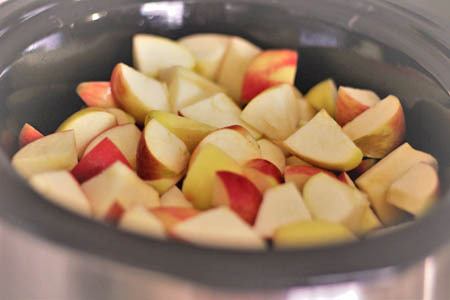 Once apples are soft, blend until extremely smooth. Return mixture to slow cooker with lid off. Heat on low, stirring regularly until spread is desired thickness (about 2 hours). Remove from heat, transfer to storage jars and allow to cool before capping and storing in the fridge. 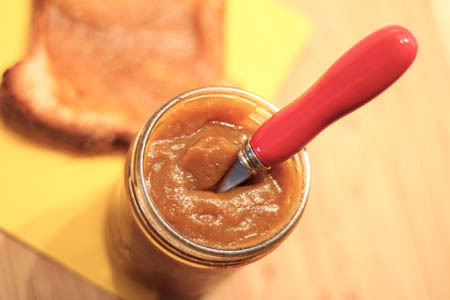 This golden Ambrosia apple butter is great on toast – we can’t get enough of it on cheese bread! It can also be stirred into hot cereal, poured over vanilla ice cream, added to a cheese platter or baked on a brie wheel. And, let’s be honest, spooned right out of the jar – with only 16 calories per tablespoon, there’s no guilt in indulging in this sweet treat!